HASK Argan Oil | For the Joy of Life. My hair has always been to my belt line. Okay not always, but for years and years. I've always been asked how I keep it so long yet so healthy. I have to admit that most likely it's because I pretty much never use heat damage. It goes in a "mom bun" almost every day. However, I've noticed that it is very coarse and hard to brush. I can't ever just run my fingers through my hair and there are always little fly away's. I've been using cheap brands my whole life because I didn't want to spend a fortune on hair products. It just didn't seem necessary. 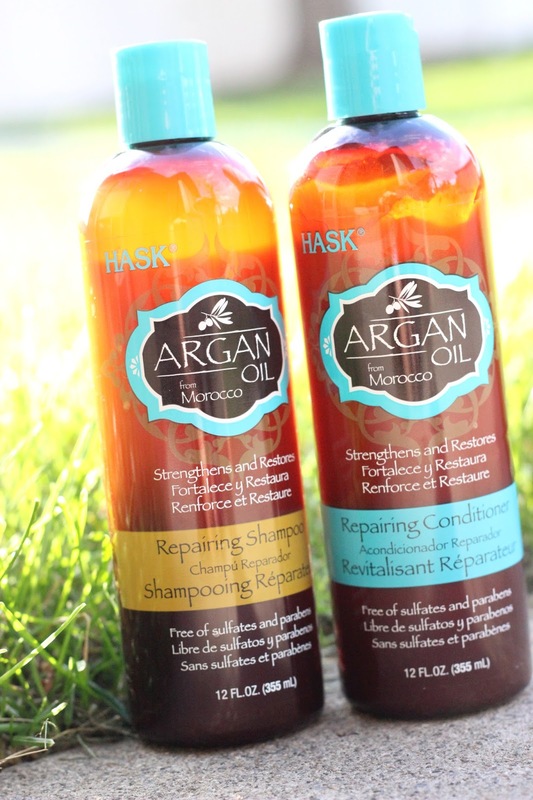 Just recently I started using HASK Argan oil shampoo and conditioner and it has been a complete game changer! Not only is it affordable but it has been working wonders on my hair. My hair is so much softer and just looks even healthier. I love the smell and how easily it washes out. Since using HASK Argan Oil shampoo and conditioner my hair is so much more manageable. I've been able to try out many new fun styles because it looks and feels so much healthier. HASK products are free of sulfates, parabens, phthalates, artificial colors, drying alcohol, and gluten. HASK has a variety of different exotic oil hair products designed to treat and repair particular hair types. There are shampoos, conditioners, deep conditioners, and shine oils in their collection. The different types of oil they offer are Argan oil, Macadamia Oil, Monoi Coconut Oil, Almond Oil, and Keratin Protein. 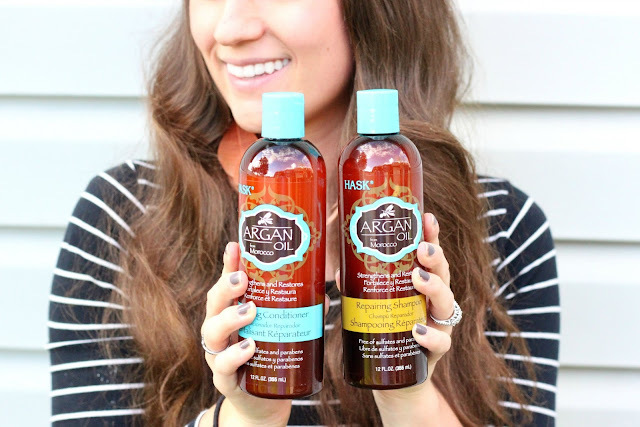 I have LOVED my Argan oil shampoo and conditioner so far. It is meant to Strengthen and restore dry and damaged hair and has a very fresh orange citrus scent. Argan oil, is known for its high absorbing, penetrating, and split-end repairing qualities while leaving hair soft and nourished. I can testify that it truly does work and I am so happy with the results! Head on over to HASK'S website and check out the variety of products they have! This is a sponsored post powered by BrandBacker. All opinions are mine alone. This sounds like something I'd like. Thanks for sharing it! :-) Your hair is just beautiful! Holy cow your hair IS amazing! 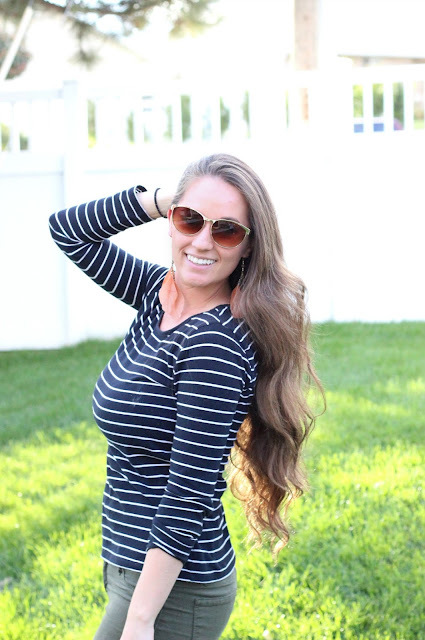 I love that this product really works for and it's free of sulfates and other icky toxins! Thank you so much! Yes! I love how clean it is! I love Argan Oil. So great for healthy hair. yes! I'm just learning how great it is! Your hair is amazing! I wish I could grow mine this long but it's SOP thick that it becomes unbearable after a point. Sounds like a great product, in this day in age where we don't know a lot of what's in our hair products! your hair is so beautiful! 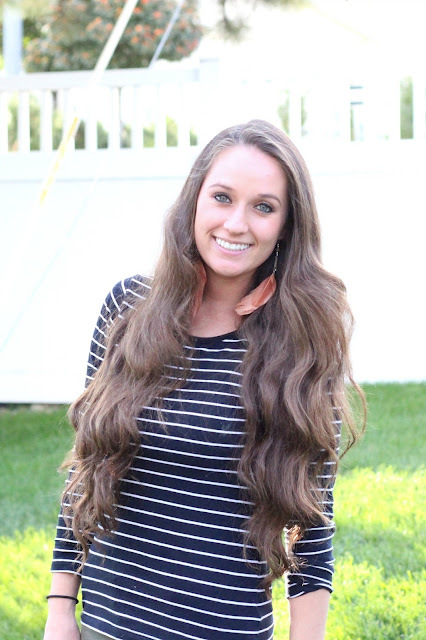 i love your hair and argan oil!!! Your hair is gorgeous! This sounds like a great product. Your hair is so long and gorgeous! I recently cut mine a few inches shorter and it feels weird already. Every time I cut my hair it takes time to get used to! Your hair is beautiful! My daughter likes to have her hair long, and it is just as long as yours. She is only 7 so it is a lot of work on my part to keep it looking good. I have not heard of this product, thanks for the tips! sounds like my kin of girl ;) thanks for stopping by! Well that company might make millions more after seeing how awesome your hair is!! Jealous!! One Day :-D thank you for sharing! You are SO kind! Thank you so much!! You have gorgeous hair, I use argan oil on my hair and skin! Thank you! I'll have to try it out on my body! thank you so much! I agree store brand goes by way too fast! You have gorgeous hair!!! Thanks for sharing one of your secrets.